Thinking about a cruise— sans kids? 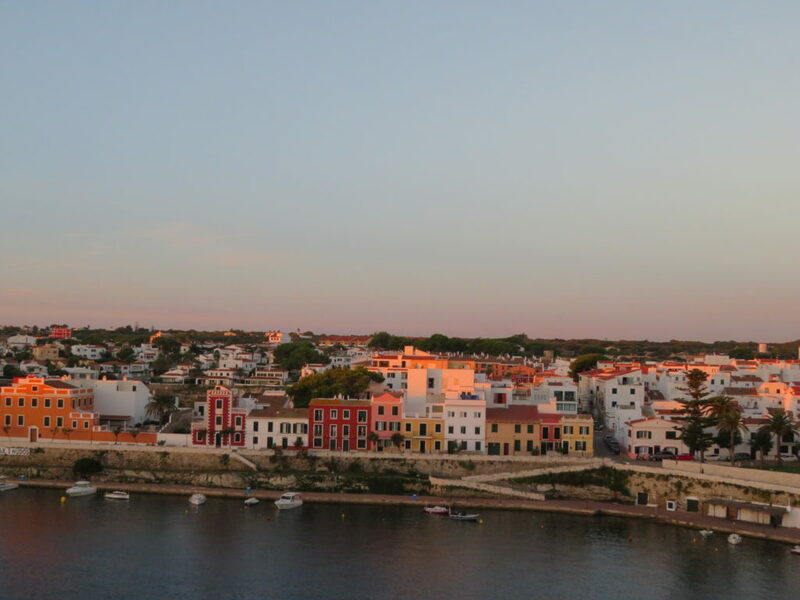 Whet your appetite by reading about a recent Mediterranean cruise on the Seabourn Encore. Everyone, especially moms, need some pampering. 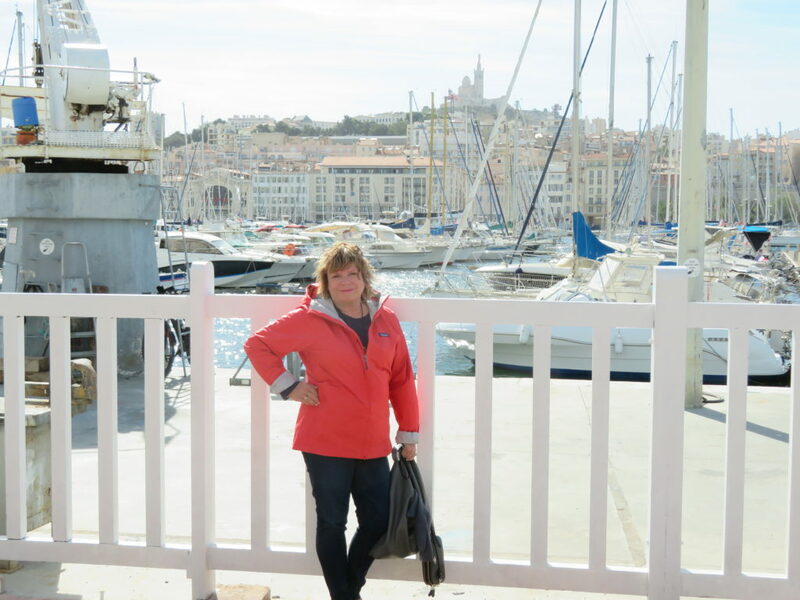 A Mediterranean cruise tops many a travel bucket-list—it was on mine and I wanted to “do it up right.” It was easy to talk my husband and our favorite fellow-foodie friends into the plan. 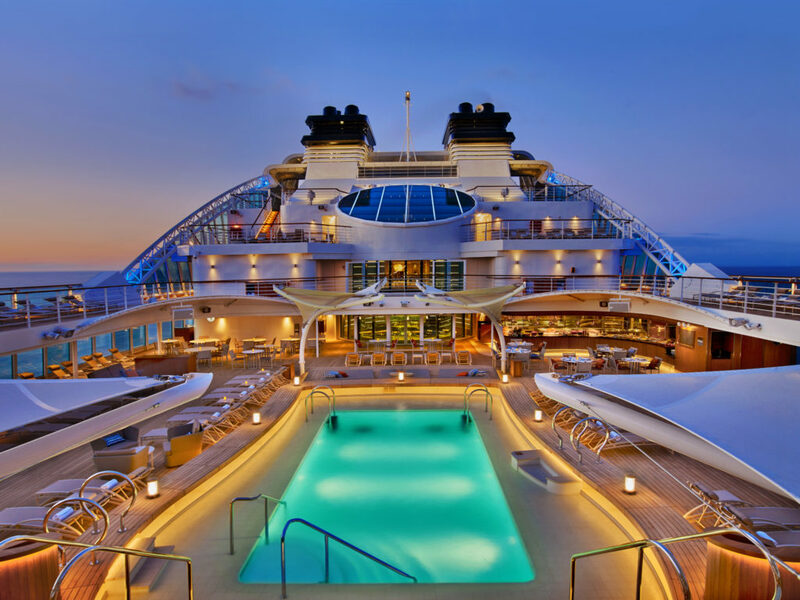 I booked the ultra-luxury Seabourn Encore cruise ship. On a brilliantly-sunny September afternoon, we boarded the Encore in Barcelona, Spain, just in time for an al fresco lunch at the Colonnade restaurant. By 5 p.m. we had settled in, and were back on deck, cocktail in hand, to enjoy opera-accompanied sail away. It was on. Our seven-day Romance of The Rivieras adventure began. Hello Spain, France and Italy. 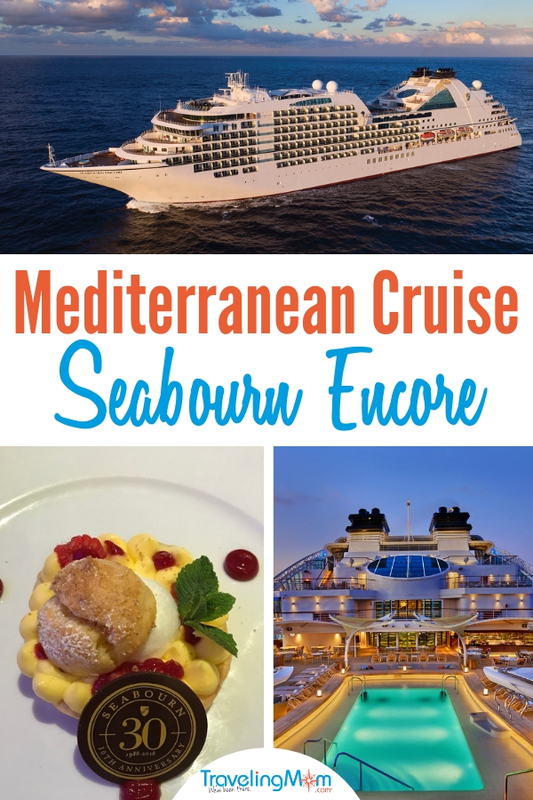 Seabourn Encore—What a Gorgeous Cruise Ship! 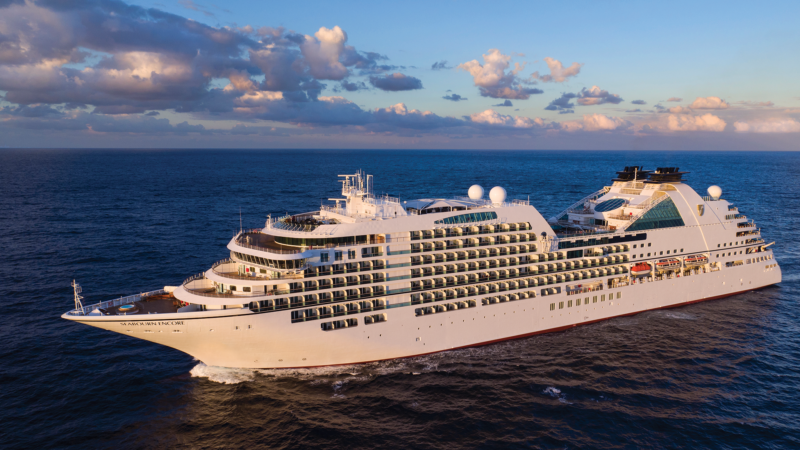 The Encore and the Seabourn Ovation (both launched in 2016) are the “big sister” cruise ships to the line’s older yacht-like trio of vessels, the Odyssey, Sojouorn and Quest. The Encore carries 600 passengers in 300 suites. Renowned decorator Adam D. Tihany hits every mark. A little bit art deco, a little bit mid-century— it’s sumptuous— and channels the feel of luxury cruise ships of yore. The Seabourn Encore is an all-suite vessel, and so everybody gets a balcony. 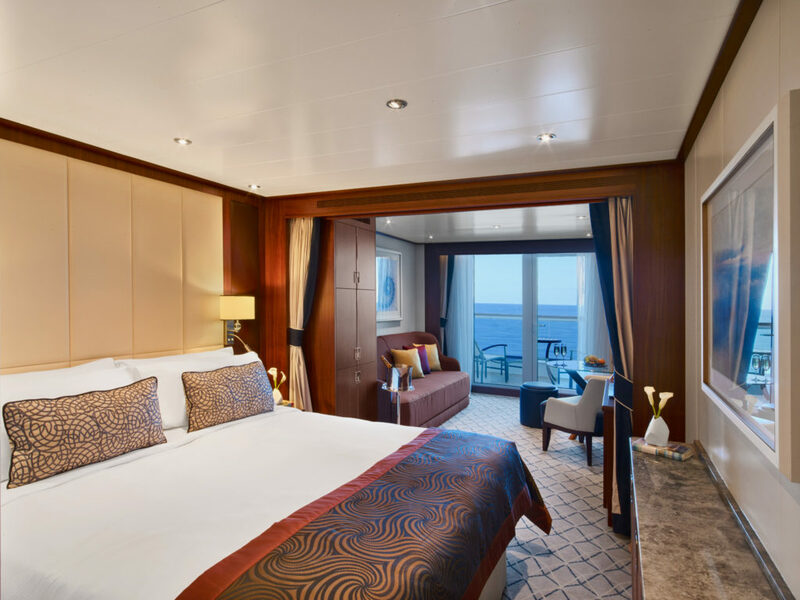 We loved our mid-ship suite #637 – spacious, luxurious, and well-appointed. A creamy palette is accented with rich navy accents, and a comfy queen size bed (twins are available) is outfitted in high-end linens. Plush drapes separate the bedroom and walk-in closet from a cozy sitting area with a couch, chairs, ottoman and a glass topped table for in-suite dining. You can swivel the large wall-mounted TV in either direction. Floor-to-ceiling glass sliders frame the ever-changing view and provide access to the balcony – which we found more private than those of other cruise lines. The luxe marble bathrooms have a pair of sinks, loads of shelves and drawers, and co-branded Molten Brown toiletries. The majority have a shower and a soaking tub. Quibbles? The make-up vanity is too small and dimly lit. Within minutes of arriving in our suite, we were warmly greeted by our stewardess; however, we didn’t see much of her as the week progressed. Seabourn suffered, say, in comparison to Silversea’s anticipating-your-every-need butler service. We returned to our cabin one evening to find our lunch-time room service tray still on the table. We put it out on the balcony. The next afternoon, the tray, crumpled napkins, leftover congealed fries and all, were back in our suite. Ugh. Overall, we felt the service needed some attention. In chatting with other passengers, the consensus was the cruise ship was a bit short-staffed. Waiting 15 minutes to place a drink order or catch the barkeep’s eye is not what one would expect. Hailing down a waiter during lunch in the Colonnade could be a challenge at busier times and on occasion, we received a bit of ‘tude. In fairness, these occurrences were rare. Most of the staff was friendly, and they hustled and aimed to please. “And how was the food?” everyone asks. Excellent! 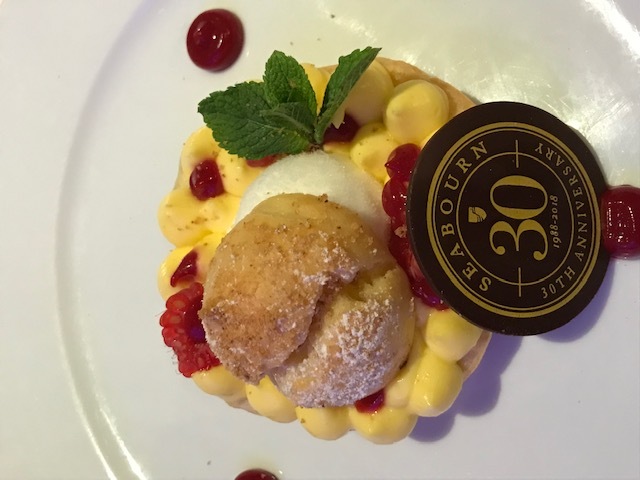 … with just the odd “miss.” Seabourn Cruise Line is a member of the Chaîne des Rôtisseurs, one of the world’s most prestigious gastronomic societies. It shows. The cruises are all inclusive and the wines (better than expected) and spirits are complimentary. There are no surcharged restaurants. The casual Colonnade is a bustling venue, with an open kitchen, offering bountiful buffets for breakfast and themed (e.g. Mexican, Indian…) lunches and dinners. However, they’re happy to cook your eggs to order or flip you a burger for lunch. You’ll find full service in the evening in the restaurant. The formal venue, The Dining Room, is coolly elegant, graced by a striking sea-blue chandelier. The menu is divided into “Classics” presented nightly (a simple consommé, steak, roast chicken) and “Inspirations,” changing creative first, second, and main courses. Standouts were the black truffle risotto, the chilled marinated ricotta flan with pesto sauce and a perfectly prepared rack of lamb. A (mostly) well-trained and pleasant young staff manages your order with a programmed iPad. They flit back and forth, consulting the device, changing up your silverware. Here a fish knife, there a soup spoon. Interesting. Sushi – self-explanatory— is another dining venue option. Traditional Japanese chefs guarantee authenticity. The restaurant features bento boxes at lunchtime. Small plates and sashimi galore are there for the asking. And, of course, saki. The poolside Patio offers a changing buffet and the obligatory burgers and hot dogs. It’s great spot for a late morning Bloody Mary delivered to your chaise lounge. Guests can dine in the evening at the Patio as well. The menu is limited— steak, a grilled fish, a pasta dish – but for those looking for a more casual night, it works. pièce de résistance is The Grill by Thomas Keller. World-renowned Michelin-starred Chef Keller partnered with Seabourn Cruise Line and bestows some of his magic throughout the ship. Keller is famed for his Napa restaurant, The French Laundry, but the Grill is chef’s take on a high-end chophouse and has a nice club-y ambiance. My husband went old-school with eggplant parmesan – exquisite. I ordered a ribeye and it was among the best I’ve ever had. They serve house wines, but there’s a well-curated wine list presented if you’d like to round-up the experience and treat yourself. Reservations required and limited. The Encore is well laid out and compact enough to easily get around to the public areas—all of which are aft. The Seabourn Square on Deck 7—an expansive, yet inviting, space—incorporates guest services, a library, lounge-like comfortable seating and a coffee bar. A skilled barista opens at 6 a.m. and serves your choice of java – espresso, cappuccino…. you name it – to enjoy there, or in a to-go cup. You can pick up a breakfast pastry or a sandwich there as well. Oh, and this is the place to get divine house-made (ship-made?) gelato. No wonder it’s hugely popular. Note to Seabourn: the barista could use an assistant. Up on Deck 11, the stylish Observation Bar is indeed designed for “early birds to night owls” as touted. A dramatic skylight, positioned over the circular bar, floods the room with sunlight—and moonlight. Floor-to-ceiling glass windows and an expanded deck are all about observing, 180 degrees worth. A coffee station is at the ready by 6 a.m., and it’s a delightfully quiet spot to begin your day. Late afternoon it serves a proper High Tea. (Who doesn’t love a scone?) Starting at 6ish there’s tapas and live music. We loved the intimate piano bar adjacent to The Grill. It has a jazz-club vibe and the bartender concocted a perfect Sidecar. The Club—a la nightclub with a terrace has a terrific band playing pop hits that gets everyone up dancing. The largely standard entertainment in the Grand Salon (a nice enough spot, despite some sightline issues) is “fine.” The production “An Evening with Tim Rice,” replete with Broadway show tunes, was the highlight. There’s a pint-size casino and a few boutiques to browse. The Spa at Seabourn offers all that one might expect, and more, with the Dr. Andrew Weil partnership offering guests holistic and mindful living programs. The restorative yoga classes are lovely. TravelingMom Tip: Book your massage book. The schedule fills up quickly. For those who want to “gild the lily,” there are premium suites with additional amenities. Then there’s The Retreat. High up on Deck 12, The Retreat offers—for a hefty price—the use of one its 15 private living-room-like cabanas that encircle a whirlpool tub, and a concierge at the ready. The demographic ranges from 40-somethings to those into their 70s. There weren’t more than a handful of kids on board, and model children they were! During July and August, Seabourn incorporates some children’s programs, but parents should know there’s no ziplining, rock climbing walls, or hobnobbing with costumed cartoon characters like you would find on Disney cruises or megaships. 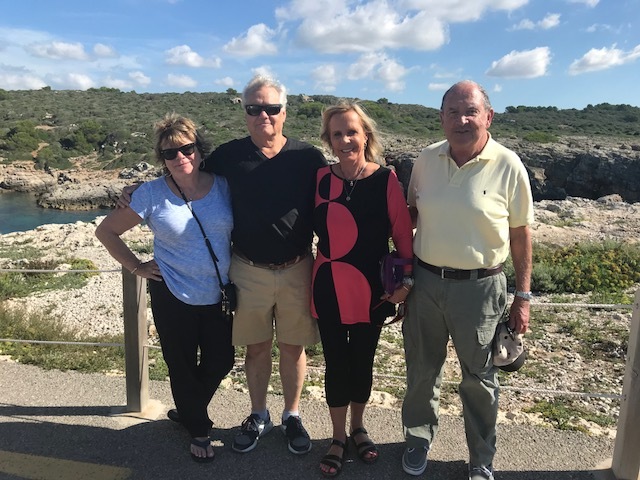 We found a convivial mix of sophisticated travelers: Americans, Brits, Aussies and Europeans who were “satisfied customers.” Luxury doesn’t mean “stuffy.” Seabourn gets that. We Wish: The pools were warmer. We Loved: The ship’s layout, its “comfortable elegance”, food in general and The Grill in particular. 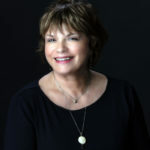 Connie is a travel industry veteran with some 30 years of experience in all aspects of the business—and a foodie. In 2013, she founded Forks on the Road, a Boston-based boutique culinary travel company. Connie defines culinary travel as discovering a destination's history and culture through its cuisine and foodways. She’s designed itineraries for the elite cookware company Sur La Table, learning journeys for groups of dieticians, and a smorgasbord of adventures for culinary curious travelers with iconic sightseeing and unique experiences on the menu. As a freelance writer, Connie shares her own travels with insight and an extra helping of advice. She adores her four grandgirls ages six to 19 years and her superhero worshipping five-year-old grandson. So, in every destination and amid every experience (making pasta, watching bees produce honey, or visiting the famed black pigs of Parma) she is thinking, “would the kids like this?” She’ll let you know. Such a well written, interesting review! Connie Walsh’s writing is perky, comprehensive and filled with entertaining details about decor, dining and service aboard the Seabourne Encore. Hope to see more reviews from this writer!